Allrecipes.com came to my rescue with this lovely little recipe for Dilly Rolls. (Apparently from the reviews this recipe is originally from Taste of Home magazine/cookbooks.) I know, not more yeast dough recipes! This time it didn't take me 2 days to get it to work. I think I'm starting to get the hang of this rise and knead and punch down and rise again stuff. Best of all, the rolls are healthy and they freeze and reheat great. 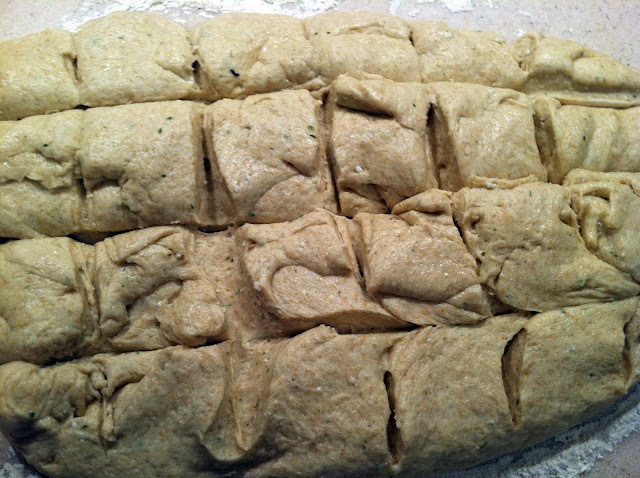 I assume everyone else is as paranoid as I am about working with yeast dough, and so I included lots of step-by-step photos and instructions here. 1.) Heat the cottage cheese and butter in a saucepan on medium heat. Set aside to cool to around 110'. 2.) In a separate container proof the yeast in the warm water. 3.) 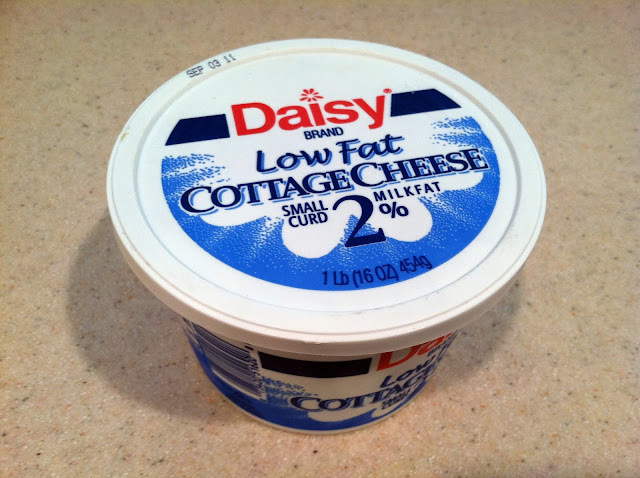 Add cottage cheese, yeast, and the eggs through the baking soda. 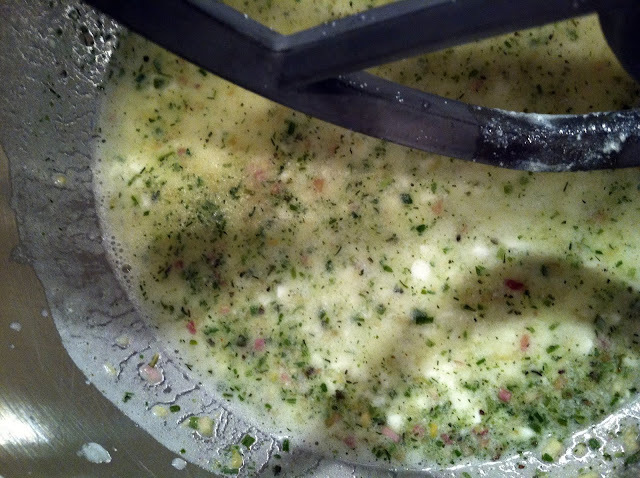 I didn't have dill or dehydrated onions on hand so I used 2 heaping Tbs of a Penzey's Spices mix called Sunny Paris with dill, shallots, chives, pepper and terragon. 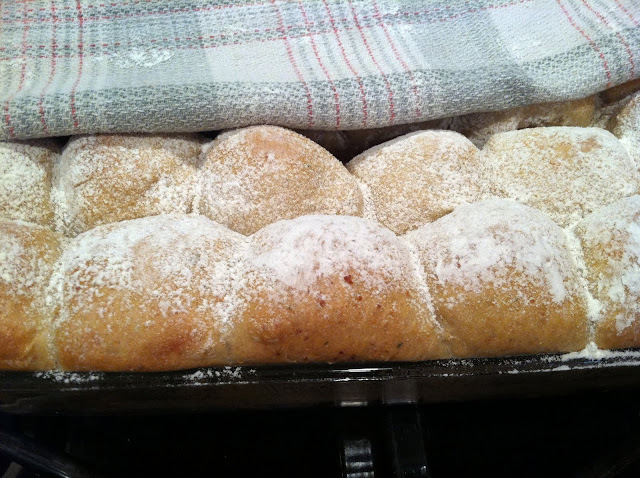 The results were mild enough that when they baked up I could still enjoy the rolls with some jam and butter. 4.) Add the flour, mixing as you go, a cup at a time. Add enough additional flour to get a soft dough. I added another cup and a half for almost 6 cups total. 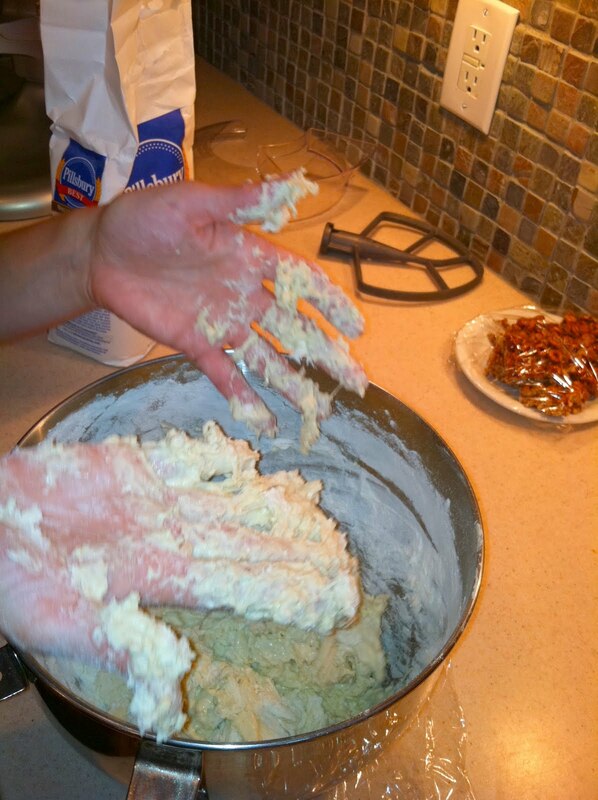 Flour your surface and hands and add additional flour as you knead. Sorry no photos on that step. I was on my own and my hands were pretty sticky. You can also let the dough hook in your mixer do the work. You know the dough is ready when it doesn't tear easily when you try to form a rectangle with a small hunk of dough. 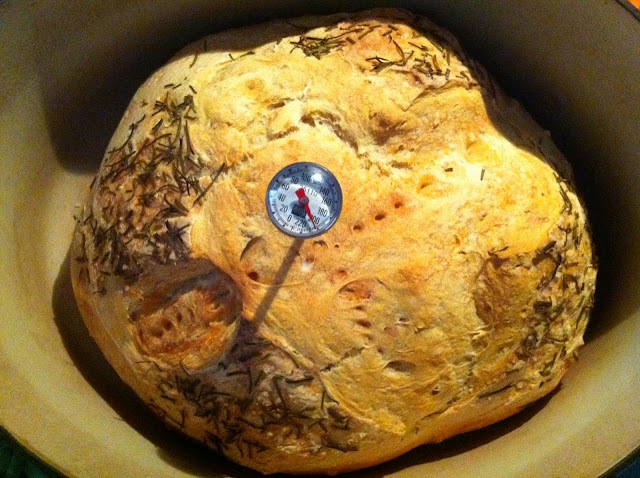 Also, when you press in the center of the dough it springs back slowly. 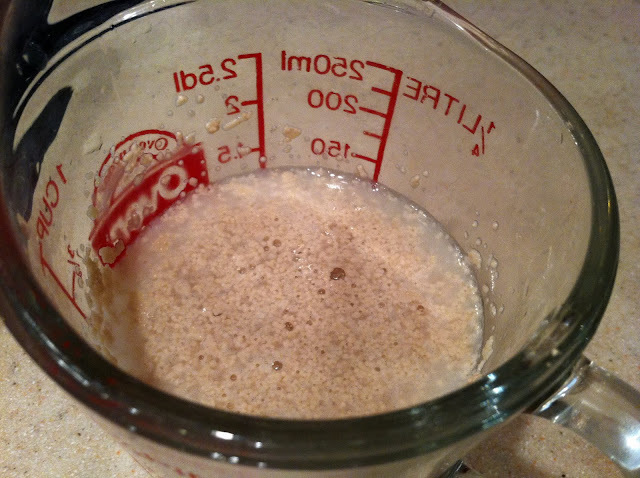 Here's what your dough will look like after 8-10 minutes of kneading. 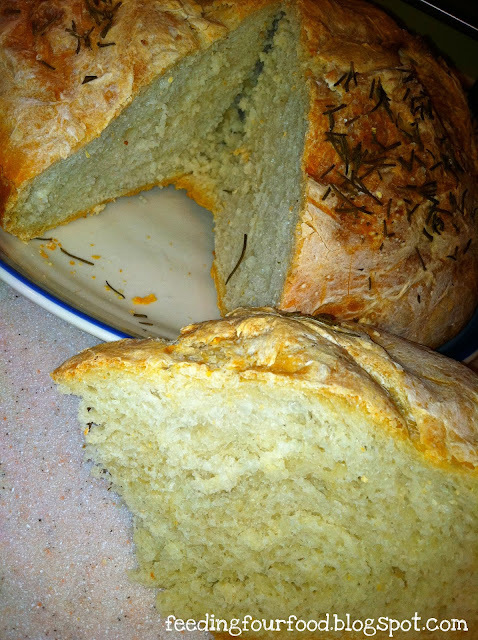 Do a search on You Tube for videos on how to knead dough by hand if you're not familiar with it. 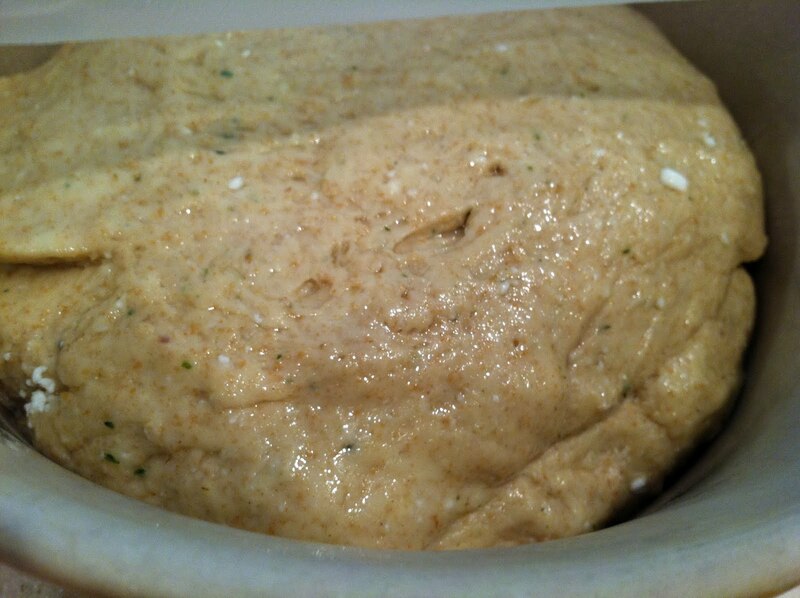 This dough is oiled already which accounts for the wet look. 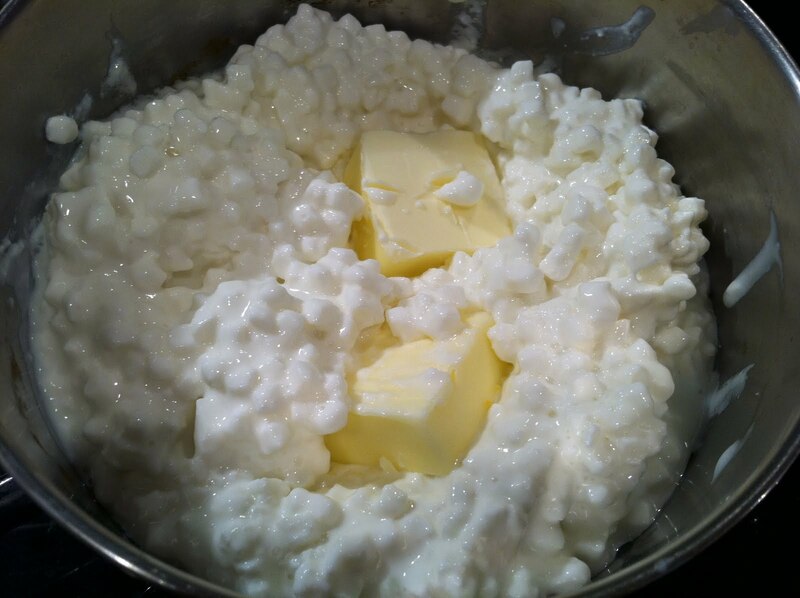 You can still see some chunks of cottage cheese. It will melt into the final product. 5.) Form dough into a smooth ball and place in an oiled bowl, turning once to oil both sides. 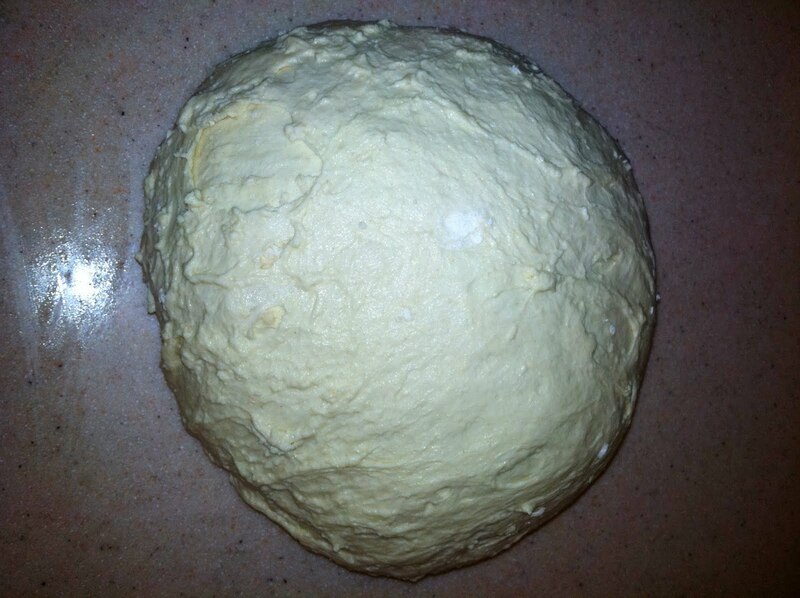 Cover and let rise until double, about an hour. 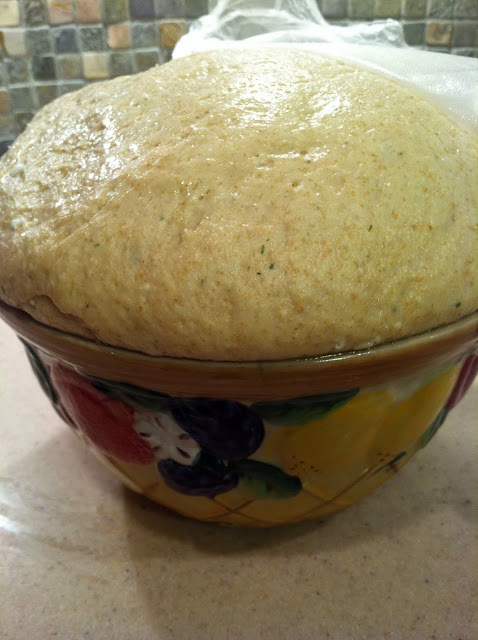 Of course, make sure you put it in a bowl large enough to accomodate the rise or you'll end up with this. Reminds me of what it feels like to be 8 months pregnant, bursting out of everything you wear. 6.) Punch the dough down. Shape it into a long rectangle and score with a knife into 4 by 6 squares like so. This just helps you get more even sized rolls. 7.) 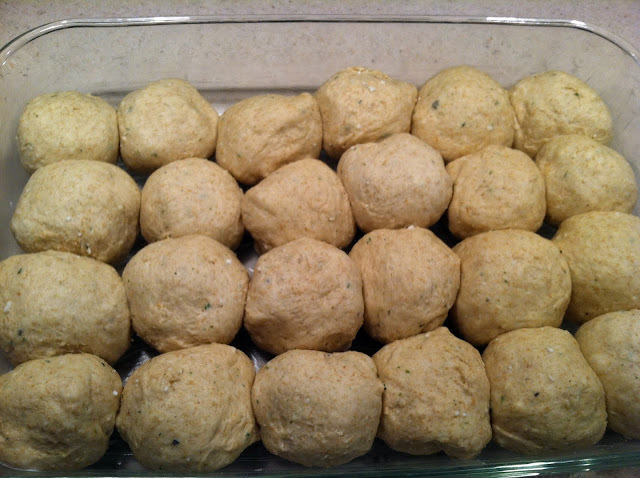 Form into 24 balls and place in a greased 9" x 13" pan. These rolls were so tall and luscious next time I'm going to try and make two pans and make the rolls smaller. I think they'll cook more evenly that way too. 8.) Let rise until doubled, another 45 min to an hour. Preheat oven to 350'. Brush with cream and place in oven. 9.) Halfway through baking, dust with flour. If the rolls on the outer edge start to get too brown before the ones in the center cook through then cover with foil. Bake 20-25 minutes. 10.) 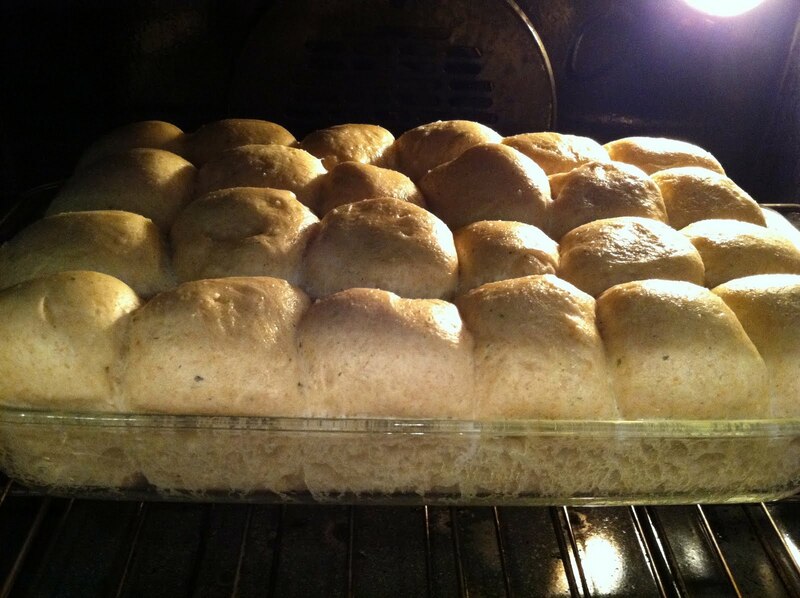 Remove from the oven and let cool slightly before tearing off the rolls you want for your meal. When the leftovers are entirely cool, place them in a container in the freezer and reheat for another meal. A picture's worth a thousand words so I'll be brief. Make these. Today. And eat a couple. You won't regret it. Thanks again to Allrecipes.com for this one. I made some modifications from the original. Who can help but tinker. But really, these are great. 1.) Shred one medium zucchini for 2 cups zucchini. 2.) Combine eggs through sugar and fold in zucchini. 3.) Beat in the dry ingredients. Gently fold in the blueberries with a spatula or wooden spoon, just until combined. 4.) Scoop into two well greased or lined muffin pans. I had my oat topping mix left over in the freezer from an earlier recipe. But at this point, go ahead and mix together the oat ingredients with a fork in bowl. 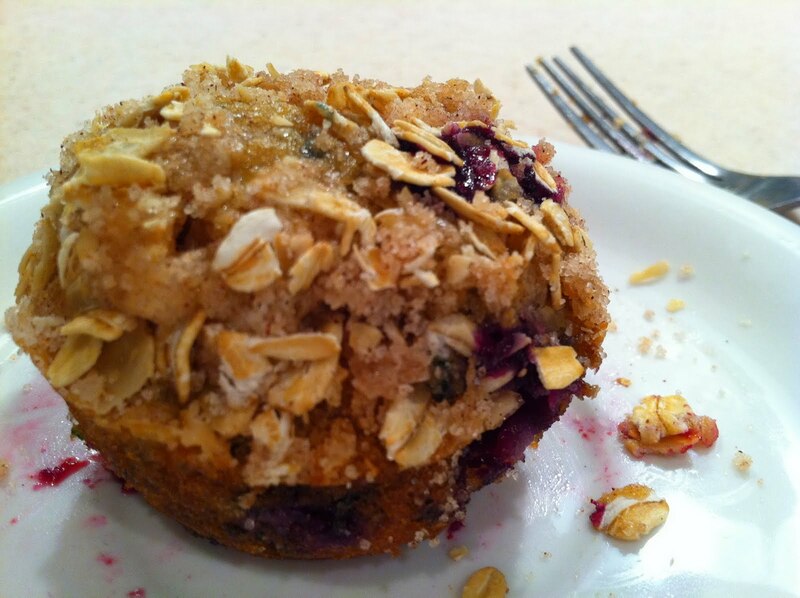 Sprinkle it over top the muffins and press with the back of a dry spoon so the oats sink into the batter. Okay, great tip. 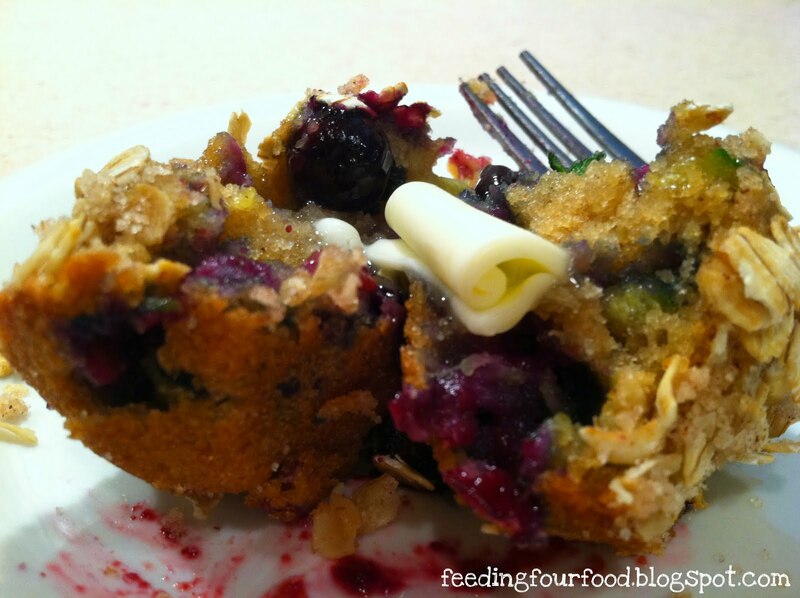 If you have some empty muffin tins for some reason, fill them with water before putting them in the oven. This will keep the pan from warping while the muffins bake. Don't you hate it when that happens? Just make sure you remember the water in the pans and don't try to flip the muffins out onto the counter. Very messy. 5.) Bake for around 15 minutes or until a pick comes out clean. Rotate halfway through. Let cool before removing from the pan. I baked these the same day I made some bread rolls and my house smelled heavenly. Some things go hand-in-hand, like peanut butter and chocolate or kids and dirt. 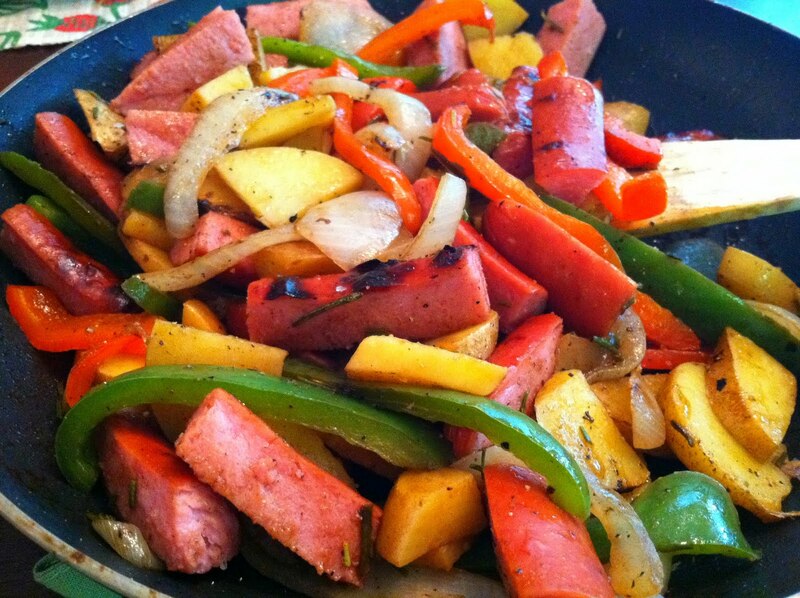 Magic happens when you mix potatoes, onions and peppers with smoky, grilled turkey kielbasa. The real magic though is when your family eats it. All. Gone. If you don't have or like kielbasa, use Italian or other link or even crumbled sausage (of course frying up crumbled sausage would make this a two-dish dinner, but it is yummy), or even good quality hotdogs if you're really desperate to get your kids to eat a protein. I never know what's going to get my pickiest eater to try something. Comparing the kielbasa to a hotdog was enough to get him to clean his plate. Then he smiled and said, "This tastes just like sausage. I love sausage." Just smile and nod, Mom. 1.) Grill the kielbasa (or pan fry it if you want) until heated through. Half the kielbasa links and then slice each half in 2-inch long pieces. Set aside. 2.) Wash your veggies and slice them--the peppers and onions in long strips and the potato in thin, 1-inch pieces, skin on. You can play with the veggies here. Try squash, zucchini or sweet potatoes. 3.) Heat the olive oil in a pan on medium-high heat. If you've pan-fried your kielbasa, just use the same pan. 4.) Saute your veggies until tender. I add a splash of water to the pan and put the lid on to steam them and help the potatoes soften up faster. Just a couple of Tbs of water will do the trick. 5.) 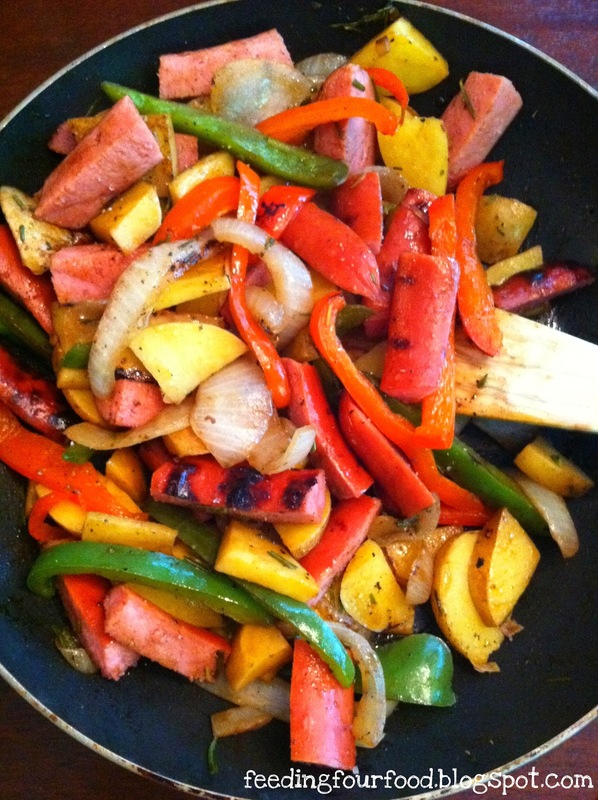 When the veggies are tender, slide the kielbasa into the pan. Add your balsamic vinegar, salt, pepper and herbs. 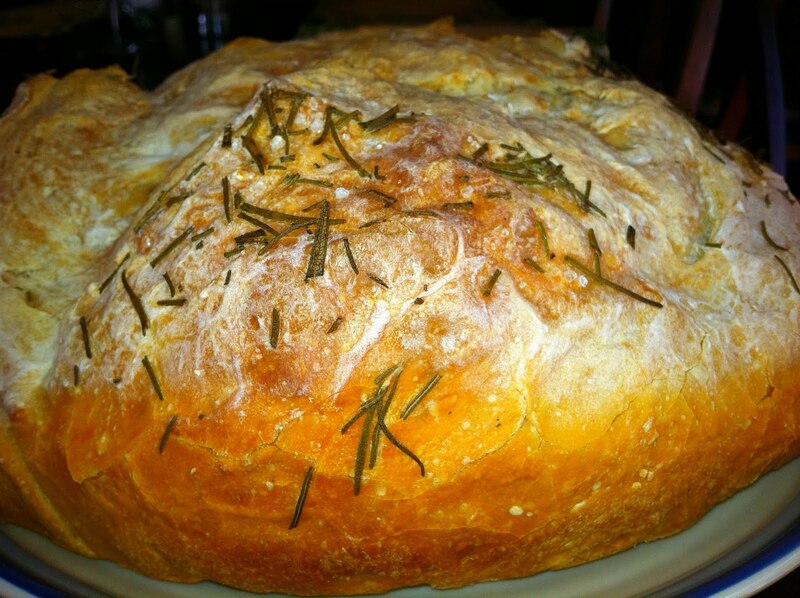 I used one spear each of fresh lavender and rosemary, chopped. If you don't have fresh herbs on hand then 1 Tb dried Italian herbs (oregano, basil, rosemary mix) will do the trick. Serve with warm, buttered rolls for a satisfying, homey meal. Here's a great idea if you a.) 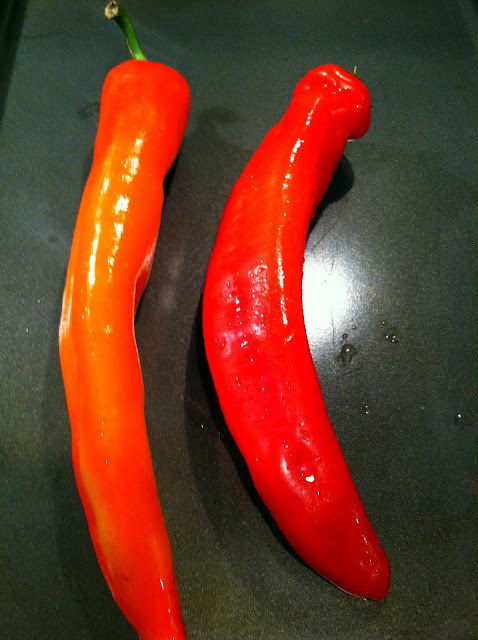 are looking for a way to use up sweet red or red bell peppers from your garden or Produce Box or b.) need something different to serve at your Labor Day party this weekend. The idea comes from the September issue of Martha Stewart's Everyday Food. It's so simple though that I'm not even going to post a recipe. All you need are a few tips. Trust me. You can do this. 1.) Move the top rack on your oven as high as it will go. Preheat the oven on broil at 500'. 2.) Rub a little canola oil on the peppers. Arrange them whole on a baking sheet. This works best with red bell peppers but these (...ah, anyone know what these are?) worked too. 3.) Roast the peppers until blackened, turning to cook all sides evenly. Salad tongs make this job much easier. I've also roasted peppers over the flame on my gas stove top and on the grill. Grilling or broiling works better for peppers this size. The broil method takes around 10-15 minutes. The skin will be slightly charred, bubbly and start separating from the flesh. Peppers will be tender and collapse slightly. 4.) 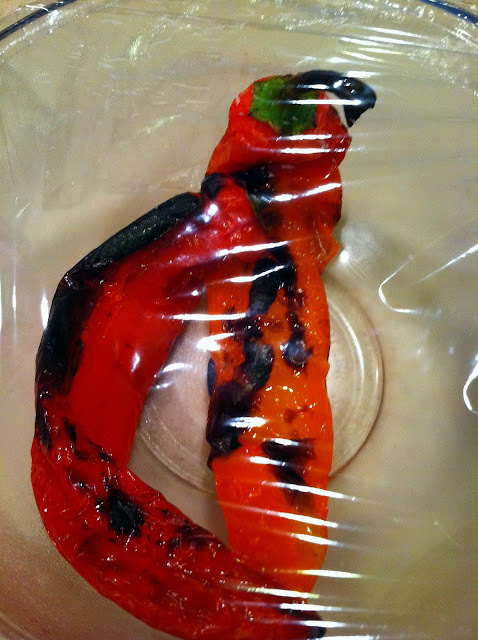 Place the peppers in a bowl right from the pan and cover with plastic wrap. Let sit and steam in the bowl for 15 to 20 minutes. 5.) Take the peppers out of the bowl and rub off as much of the thin sheets of skin as you can. 6.) Chop off the stem and slit the pepper down one side. Use a knife to scrape the membranes and seeds from the inside and chop the flesh into large strips. 7.) Arrange the peppers on a plate. Drizzle with salt, pepper, olive oil and balsamic vinegar. You can serve them just like that or sprinkle with feta cheese, capers, chopped olives and/or fresh herbs. 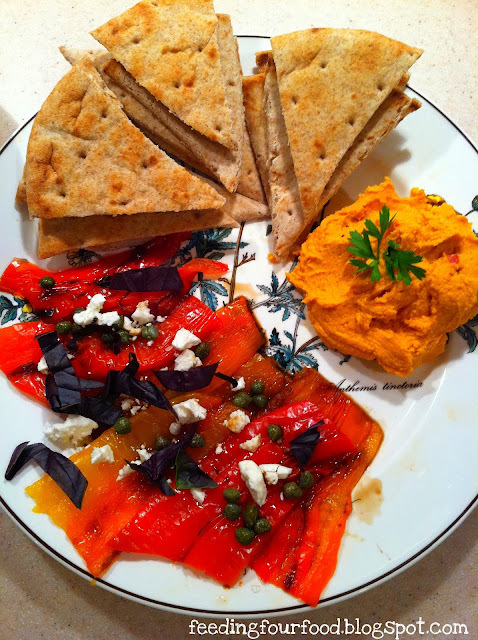 I served the platter above with storebought grilled flatbread and roasted red pepper hummus.You can make these hours ahead of time and have them waiting in the fridge, although I think I'd like these best slightly warmed or room temperature. 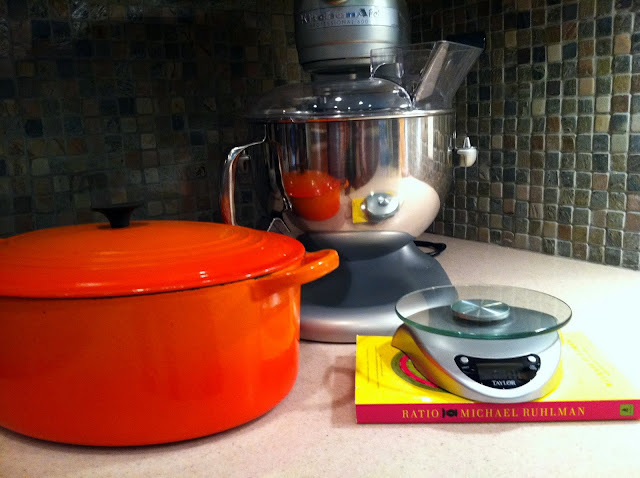 Check out the blog Lady Behind the Curtain today for some great peach recipes. She featured my Southwest Salad with Grilled Peaches. Happy Friday!